We have an unboxing and review diary of a different color scheme. To cut a long story short, these are a pretty good value for the price [or a much higher price] ~ assuming you want actual earbuds and not in-ears. If you are not deterred by the Venture Electronics’ owner threat to ban 1-star reviewers [a horrible practice at best], Massdrop is back with a fully unlocked offer on the new condition VE Exclusive Blue cables for Massdrop headphones for $50 with free US shipping. There are various options for cable connectors and cable length shown in the listing and selected in the shopping cart when you checkout. But wait, there’s more! On the same listing, they have the Braided IEM cables for $10 plus shipping. They come with your choice of 2-pin or MMCX on one end, and 3.5mm or 2.5mm on the other end. These will ship in mid-April 2018. They are baaaack! If you want to jump on the VE Monks bandwagon and don’t mind waiting, Massdrop has them back on, with the offer fully unlocked going for $5 plus shipping. They are the new condition onk Plus Earbuds (Exclusive Blue)! There are two blue variations in the shopping cart, midnight-blue or transparent-blue. Also in the shopping cart, you can models with mic/remotes for +$2 to +$5 on the regular price, making them $7 or $10 plus shipping. 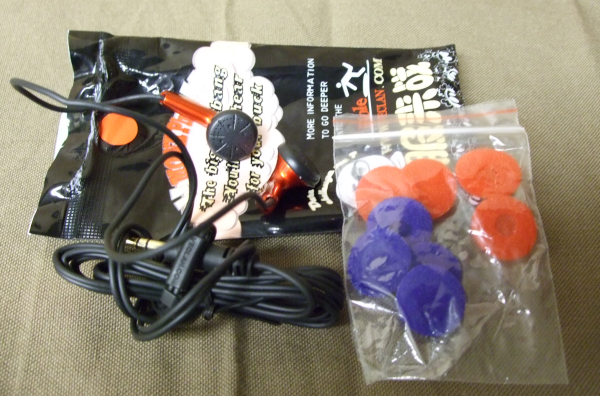 You can also get a braided cable option for +$15, and an expansion pack (various little earbud accessories) for +$5. All these are optional though, you can just get the earbuds for $5 if you don’t want/need anything else. Check the listing over there for pictures of the various variations. PS: if you haven’t heard of these before, they are actual earbuds, not in-ear canal. If you want to jump in the curiosity that is the VE Monk plus actual earbuds, but don’t want to wait for Massdrop or get slow no-tracking free shipping from China, there is an alternative. If you are a Prime member, you can get these in about two days for $10 from the Venture Electronics Amazon store, with the orders fulfilled by Amazon. Non-Prime members get free shipping with a $25+ order. They average 4.1 out of 5 based on 48 customer reviews there. The one above is the “Smoke/Clear” color scheme. I have a different model, the red color scheme and for that we have a review diary and a text and pictures unboxing too. It’s back on again! It’s hype train may not be as strong, because we are easily distracted by newer discoveries, but it still has a special place in audiophoolia, it’s the new condition VE Monks Plus Earbuds (actual earbuds, not in-ears) in the blue color scheme going for $5 plus shipping. At checkout you have the option between a transparent blue or a midnight/black blue. You have other options at checkout as well. You can get one with a different mic/remote combinations for a few dollars more, or even go for a braided cable, or an accessory pack. I don’t have this particular model, I previously bought the red ones and posted a text and pictures unboxing, including a picture of the envelope they ship in 🙂 We also have an (incomplete) review diary of these. If you want to try the VE Monks Plus earbuds and don’t want to wait for Massdrop or delivery from China, and you are a Prime member, you can get them to sit on your ears in two days, if you are willing to pay $9.90. These are sold by Venture Electronic, with the order fulfilled by Amazon. This is currently the only item the Venture Electronic Amazon store carries. I jumped on the VE Monks bandwagon earlier on, here is a text and pictures unboxing (the red model) and an on-going review diary. They are back! $8 is the ticket for this thrifty hype train! Massdrop is back with an all-blue color scheme of the VE Monks Plus earbuds. They go for $5 plus $3 flat shipping. These are true earbuds, but that’s not all. You have an option to get a model with mic/remote for $5 more (iOS or Android options), and they also have another +$5 option that gets you an accessory pack. The offer is running for the next seven days from blog posting date (New Year’s Day) and will ship late January 2017. I don’t have this all-blue model, but I have the red, here’s the useful text and pictures unboxing and an on-going slow-moving review diary. Party on Wayne! The VE Monks hype train is back at the station! A new offer is up and running at members-only Massdrop, it is a blue exclusive color scheme of the “VE Monk Plus” earbud going for $5 plus $3 flat shipping. These will ship late December 2016 from Massdrop. But that’s not all. In the shopping cart, you have optional upgrade options, you can get one with a mic/remote (options are +$2 to +$5 depending on the number of buttons), and you can also get an accessories bundle for +$5. These are true old-school earbuds, they sit outside your ears. I don’t have the blue color scheme, but I do have the red one, here’s the unboxing and here’s an on-going review diary. For just $8 you can become a Monk without giving up secular life. An audio monk of sorts, the red color scheme of the Venture Electronics Monk Plus earbuds are fully unlocked at Massdrop for $5 plus $3 flat shipping with the offer ending in about two days from today. A maximum of 6500 units are available from this drop. The shipping estimate is a reasonably reasonable (by Massdrop standards) September 1st in 2016. All sales are final. Blue and red earbud covers are included. There’s also a link to a long interview with the VE CEO there. PS: Massdrop is a members-only shopping club, it’s free to join but you have to be joined and logged in to see the offers. They are behind a login-wall because of MAP restrictions and such.